- Receive the latest ECA Guidance Documents at no costs! Highly qualified personnel is crucial in the pharmaceutical industry. The ECA Certification scheme with 14 continuous education programmes trains you adequately. Are you looking for certain GMP/GDP Training Courses? The GMP/GDP Matrix will help you find your training course. 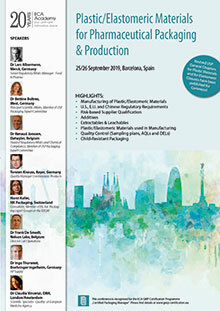 With news, trainings and conferences, a comprehensive guidelines database, publications and more the ECA is the leading European training and information services provider in the GMP and GDP environment. Following the Q&As on what data is required for sterilization processes of primary packaging materials published in 2016, the EMA recently released the new Guideline on the sterilization of the medicinal product, active substance, excipient and primary container. In March, the American authority FDA issued a Warning Letter to a US pharmaceutical manufacturer due to numerous violations of GMP. Among other things, inadequate cleaning of the equipment, errors in the stability studies as well as in contamination control were found. Regulations require that the critical process variables should be included in validation. This has been recently confirmed again by the FDA in a Warning Letter. There is currently a growing interest in the development of therapies derived from cannabis and its components.The FDA recently announced to form an internal agency working group to explore potential pathways for dietary supplements and/or conventional foods containing CBD. Deviations and CAPA are still hotly debated topics in GMP inspections. This is shown once again by a recent Warning Letter issued by the U.S. FDA. In the current issue of the Pharmacopeial Forum, the USP general chapters on plastic packaging materials have been re-published for comment. Overview about all the courses and conferences, including infos on location, date, fees and the detailed agenda. Make yourself familiar with what the Guidelines say and get to all important Authority Guidelines. All GMP information on your smartphone or Tablet PC – with the new free of charge ECA GMP WebApp.